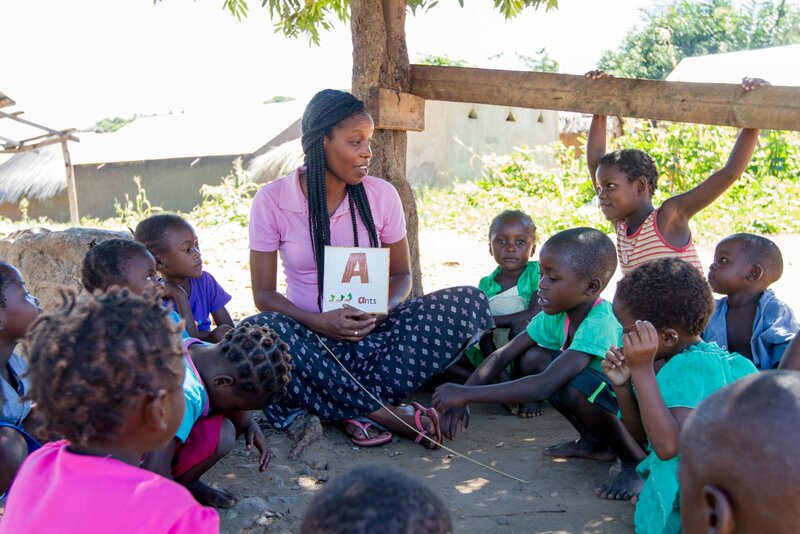 “It takes a village to raise a child.” The OM Project HOPE team in Kasama, Zambia, understands the African proverb deeply. From the very beginning of Project HOPE, OM has involved the local church and communities in reaching out to people who don’t know Jesus, believing it requires a team effort to see hope restored in neglected, but valuable, souls. James 1:27 is the key verse for Project HOPE. “The task is big, and God is asking us as Christians to care for the orphans and the widows,” said Francis Chileshe, the leader of Project HOPE. The team mobilises churches in different communities to see God’s heart for the vulnerable children, and then trains them to care for the lost. As of March 2018, 15 volunteers from different churches formed the Social Concern Group (SCG). This group identifies the most vulnerable children in the community and partners with OM to support them. “We also empower the church in rural areas to take on this role. In some townships, there are no churches. Then the OM team will go to form a group there,” Francis shared. Through regular house visits and children’s programmes, volunteers reach out and bring hope to the children. “We are not able to be there for the all the children, all the time, in all the different communities, but the church is there to provide for the urgent needs. They also know the environments and the situations more,” Francis said. OM equips volunteers to be sufficient caregivers. Each SCG reaches out to around 30 vulnerable children at a time. “The volunteers work diligently without complaining. I am very happy to work with them,” Francis shared. Volunteer Daniel Mubanga was part of the work from the beginning. Since 2012, he has been faithfully partnering with OM to lead the SCG in his church. Through the experience of taking care of his deceased brother’s children, he realised how many challenges orphans go through. Knowing Francis from childhood, Daniel was touched when Francis shared about the work, and he wanted to share the passion of bringing hope to the vulnerable. Daniel has walked this journey with many vulnerable children, and he shared that encouragement is the key. “They need people to show them the hope beyond their difficulties. They might lose their parents but not their lives.” Regularly visiting and giving positive encouragement helps the children focus on God and not give up. Daniel is dedicated to visiting the children—even if the child moves to high school in another community, he is willing to travel to meet the child and ensure they have enough funds for school fees and are walking closely with God. Challenges are still great as the team works with children experiencing trauma and living in poor conditions. Once, a few children who were helped by a SCG knocked on Daniel's door, saying that their school had kicked them out because they didn’t have enough money for tuition. Heart-broken, Daniel was not able to give them all the money they needed. He prayed, and God provided the money just in time. Now some of those children have finished high school. “Don’t compare, and be strong in Christ,” Alex Sichinsambwe encourages vulnerable children who are going through the same pain he once experienced. Identified as ‘vulnerable’ by a SCG when he was a child, he is now a 22-year-old young man studying to be a mechanic. Alex’s transformation is a great example of the results stemming from OM’s partnership with the church. Alex was one of the first boys that OM sponsored to go to school. When he was in grade three, his father passed away and his mother couldn’t provide the funds for him to continue school, so he had to stop. “I started to doubt and lose hope for school and even the hope of my future,” Alex said. Thankfully, Daniel found Alex and put him on the list of a SCG. Through the funds from OM, he was able to go back to school, eventually becoming the first person in his family to finish high school. Daniel reached out to Alex during that critical time, inviting him to join OM’s children’s programme. For 15 years, Alex was provided for by many different people. Later on, he gave his life to God though the preaching of an elder, who was also an OM volunteer. From childhood to adulthood, Francis, Daniel and the church guided Alex like a father. Their care helped him grow spiritually and built in him the ability to make right choices. Alex said that if Francis and Daniel hadn’t been there for him, he didn’t know where he’d be now. He understood that it was by God’s grace that he found hope. Today, Alex has the passion to pass on this love to other vulnerable children, so they can also experience the transformational power of hope found in God.